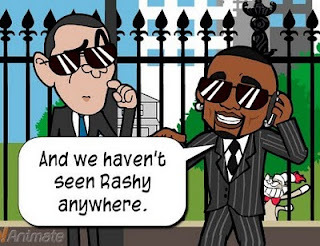 It's been several months since episode 3 of my Men In Black series staring Barack Obama and AKON but finally the two MIB Agents are back and hot on the trail of wanna be Evil Genius, Rashy (the sock monkey) - or are they? If you haven't seen the previous episodes then I strongly urge you to take the time to watch them otherwise the current episode may not make a lot of sense. You can either click the links in the GoAnimate player below to view each episode on GoAnimate or, if you'd like to read my background notes, then click the following links, Episode 1, Episode 2 and Episode 3 to take you to each animations corresponding blog post. As with previous episodes, when I started I had no idea where the story would end up. Episode 3 ended with Rashy about to set his special robot agent onto Bush and Cheney with Barack and AKON heading out to track Rashy down. I did know that I wanted to put more action into this episode. A lot of my animations tend to involve characters in verbal exchanges but the MIB films that this series parodies isn't all talk. It was definitely time for some action. In the opening scene I was really struggling for a logical location for Bush and Cheney to be, using the existing backgrounds on GoAnimate. Standing outside the White house seemed logical but why? Then I thought who better to give guided tours of the White house than the ex-administration. Unlikely but kind of funny too. Observant viewers will notice the 'tourists' are all characters from GoAnimate's I'm a Mac, I'm a PC parody ads (because I knew the PC guy had a really good action where he goes flying after being kicked - useful in 'explosive' situations). Note that when I started this series many of the props and effects that appear in this episode didn't exist as GoAnimate didn't have the Stick Man theme (where those beams of light both the Robot Agent and Alien Bush shoot at each other come from) or the Custom World backgrounds (the subway station, Agent Roy's Office and the Interrogation room). This is most evident in episode 2 where Bush turns the first MIB Agent to 'Poo' using a very poorly made prop from the GoA community. In the second scene of episode 4 when we first see Barack and AKON there is a wide shot in which you can just see Rashy in the bottom left corner of the frame. This was meant to be a one off, throw away a joke for Barack's line about Rashy being a 'sneaky little monkey' but then in the subway scene I thought, why not put Rashy in the background again? However in doing that it gave the impression that perhaps Rashy was following Barack and AKON when in fact he isn't - well not really. In the last scene with AKON where he reports in that they haven't seen Rashy all day it was just too good an opportunity to have Rashy walk across that scene in the background. It wasn't like I planned it that way. Fortunately there was good reason for Rashy to be in the exact same location as Barack and AKON, with the destroyed Robot - so it worked well in the end. I really like that Rashy is making no attempt to hide himself. It reinforces the idea that he's not actually trailing the two agents - they just happen to going to the same place and the agents just didn't notice him. Unfortunately up to that point nothing in episode 4 really advances the storyline. It's all just a bit of a chase with no one being successful. Rashy doesn't kill Bush and Cheney. The Agents don't locate Rashy. I needed something to hook people into episode 5. Part way through making episode 4 I discovered the Interrogation room background and knew I'd be using it at some point. Having brought Rashy's Dad into the story in episode 3 it occurred to me Rashy already had a former arch nemesis in the form of his brother SuperRica. Rashy was always playing some very cruel tricks on SuperRica so who better to haul in for questioning. However brothers are still brothers so SuperRica isn't going to just rat out on Rashy that easily. You'll have to wait until episode 5 to see if SuperRica will crack. I don't think there's anything else to say about this episode other than a side note about the joke relating to AKON looking like he needs to pee when he's on the phone. Unfortunately for most of AKON's body actions he dances - including talking on his cell phone. Obviously in this series he needs to use the phone a lot and it just looks odd that he's dancing whilst talking - I felt it needed some explanation. It's kind of a shame really that all the characters in AKON's theme are mostly designed to dance along with AKON's music. They're some of the best drawn characters on GoAnimate. If they had more non dancing actions (and the whole theme wasn't so restricted in terms of not being able to add custom audio or mix the characters with other themes) I think people would have used them a whole lot more.